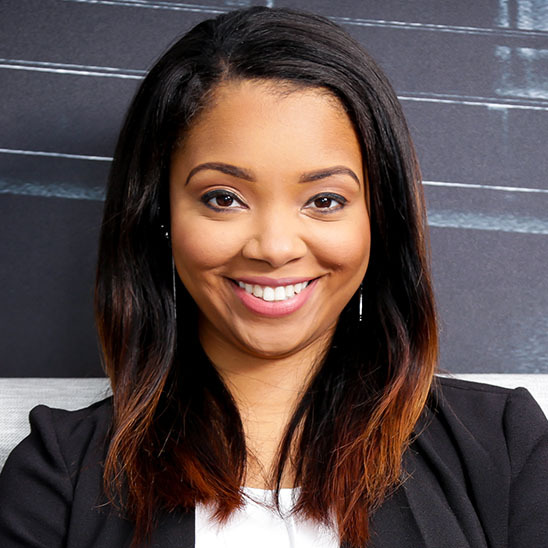 Sheena Allen was born in Terry, MS and is a graduate of the University of Southern Mississippi where she received a dual degree in Psychology (B.S.) and Film (B.A.). 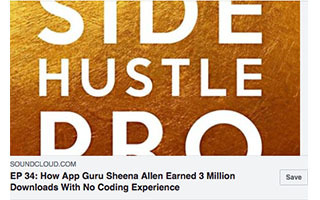 In 2011, Sheena started her first tech company, Sheena Allen Apps, and bootstrapped the media tech company to millions of downloads. While visiting her hometown in Mississippi in late 2015, Sheena took notice of how people in her community were still very dependent on using predatory financial services, such as payday lenders, check cashing, and title loan services. This led her to start her second startup, CapWay. 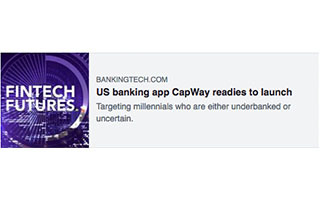 CapWay is a neobank that also includes financial education and gamified microlending for those who do not fit into the traditional banking system. 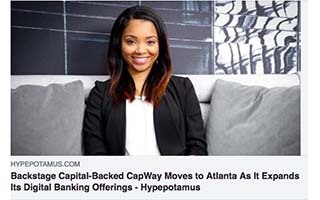 Starting CapWay at the age of 27 makes Sheena the youngest black female to have found and operate a neobank. In late 2016, Sheena made her premiere in She Started It, a documentary film that follows five women around on their startup journey. 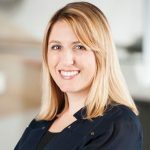 In early 2017, she released her first print book, The Starting Guide, a three-part book that talks about her journey, a guide for those interested in app development but not sure where to start, and business 101 tips. 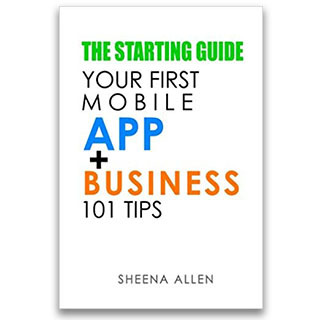 The response from The Starting Guide led Sheena to start App It Out, an interactive workbook, curriculum, and virtual sessions around simplifying app ideas and app development. 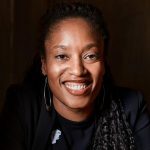 Sheena has traveled around the world and spoke on subjects such as owning a successful tech company as a non-technical founder and inclusion in tech. 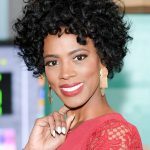 She has been featured in various publications, including Black Enterprise and EBONY Magazine. 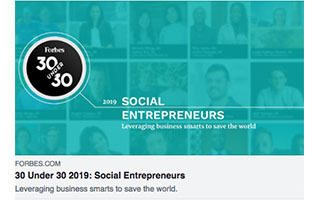 Sheena is a 2018 Business Insider Under 30 Innovator and part of the Forbes 30 Under 30 2019 class. How many times have you heard someone say, “I have this amazing idea for an app?” Well, a lot of people do! Unfortunately, most people with the idea have no clue what the next step they should take and for those who think they know, they usually assume that means contacting a developer to start coding their idea into an app. They completely skip over understanding the side of their app that should be well understood before ever reaching out to a developer. Is this a free app or does it include in-app purchases? What about UI/UX? How many similar apps are already available? Is this for iOS or Android or both? There is so much to the mapping out of a mobile app that should be done before ever contacting a developer that is never done. 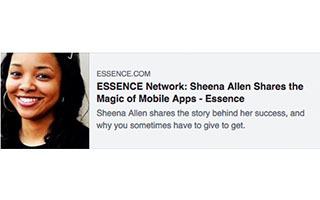 Sheena started her first tech company, Sheena Allen Apps, as a senior in college. With no technical background, Sheena bootstrapped her mobile app company to house five apps and generated millions of downloads. In building her company through trial and error, Sheena was all able to master how to map out the idea of a mobile app before ever contacting a mobile developer. After realizing that not having the proper strategy and flow chart mapped out, the lack of preparation and knowledge would cost more time and money when the app entered into the development stage. Don’t go directly from app idea to app development. That is like having a car (app idea) and tires (app developer), but with no gas (app strategy and mapping). The entire app process – from idea all the way to deployment in the app store. What to look for when searching for an app developer and what are the red flags you may be dealing with someone who won’t deliver. The interactive workshop, called App It Out, will include working hands-on with attendees to allow them to see the missing pieces in their app idea. The beginning of the workshop starts with attendees doing an elevator pitch of their app idea to test how or if their idea is as well-defined as they think. Throughout the workshop, attendees will sketch out the first few pages of their mobile app, challenge each other on holes in their flow process, complete competitive analysis, discuss funding options, traction, hiring developers, and preparing for marketing before and after launching their app. Majority of all startups focus on getting an investment from a VC (venture capitalist) or angel investor. After all, it is the companies who are raising millions and millions of dollars that are being featured by the top media outlets in the world. However, getting venture capital funding is not the right path for everyone. Many founders focus on raising money and lose focus on building their company or don’t always fully understand what it means to raise money. The reality is that for every investment a company takes, the company because less and less controlled by the founder or founding team. Bootstrapping has become something that is overlooked. While each has its pros and cons, the media has put way more pros on getting an investment versus bootstrapping. 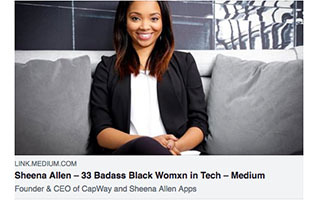 Sheena Allen bootstrapped her first startup, Sheena Allen Apps, to millions of app downloads while she has raised two rounds of funding for her second startup, CapWay. Sheena can attest to the pros and cons of each side. The reality behind raising money – less control, pressure of getting returns, etc. When we think tech, most people will think of the introverted developers who are sitting at their computer with their headphones in and coding away in a zoned out state. In reality, tech companies consist of way more than just the developer. It takes a full team with different skills to build a great company. Those positions range from the coders to designers, marketing, business sales, and so much more. If you are non-technical and have a passion for getting involved in the tech world, being non-technical should not deter you from following that passion. 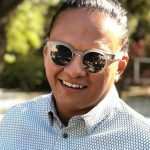 Recruiting the right team, learning your strengths and weaknesses, and a solid vision are all key components for non-technical founders, and those qualities make non-technical founders just as unique and able to build a successful tech company as a technical founder. Women and minorities are still fighting to be respected in the tech world. For a culture that has been dominated by the “bro-code” of mainly white men, having diversity in the room is becoming more and more of a demand with numbers showing that more diverse teams are more successful. From lack of respect to lack of funding, being a minority in tech has been an uphill battle. Though small victories have been won, there is still a long way to go. Sheena often has spoken about walking in rooms and realizing she has three strikes against her – she’s black, she’s a female, and she’s from Mississippi – a place a lot of the rest of the world think consists of only racists and poorly educated minorities. If three strikes you’re out is supposed to be the standard, when speaking on woman and minorities in tech, Sheena talks motivate, provide resources, and provides a guide on how being a woman and minority is tech breaks the standard. The age-old traditional banking system was not made for everyone. With over 2 billion people worldwide considered financially underserved and over half of Americans living paycheck-to-paycheck and relying on predatory services like payday lenders and title loan services to try to make ends meet, financial inclusion has become a hot topic. 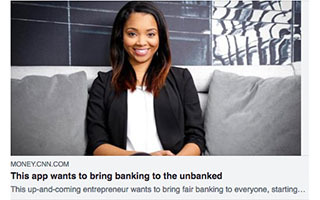 Sheena speaks on the problems ranging from no access to banks due to the increase of banking deserts, being unbanked due to lack of trust in banks or not being able to afford the fees associated with many banks, and millennials being coined the unbanked generation. Tech is now ready to have a significant impact on financial inclusion. 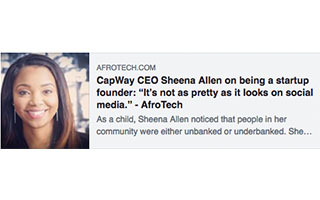 Sheena created her second startup, social fintech company CapWay, to tackle the issues with financial inclusion. 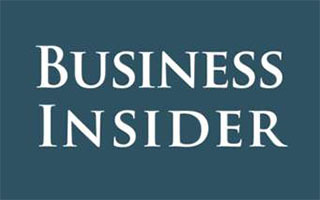 Technology has a history of disrupting industries – from Uber to AirBnB. 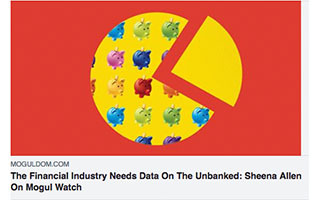 It is now time technology and new leadership use technology to create access and opportunity for those who don’t fit the model designed by banks years and years ago. Years ago, athletes wanted to be rappers; rappers wanted to be athletes. In present day, both, plus actors and actresses, want to get into tech. From rapper Chamillionaire to athletes like Stef Curry, those in pop culture are now wanting to be in tech. But who can blame them, especially when we see that pop culture has so much influence on the tech that we use daily. Black Twitter is said to have kept Twitter alive in their darkest days, blogs like ShadeRoom have built million dollar businesses by taking advantage of social media, and artists can now skip trying to get a record label and go straight to the internet. Pop culture has infiltrated the tech space and that is not going to change anytime soon. From rapping Drake’s lyrics from his song 6PM in New York, “We prolly be out in Silicon tryna get our billions on” to talking of how Beyonce shook the world by announcing her surprise album via Instagram to speaking on the false reality of social media, Sheena dives deep into the new relationship between tech and pop culture. He didn’t just hit the game winner. He hit the game winner on PG, well beyond the three point line, and effortlessly. Many people who are financially well-off always minimize the solution for people who are financially struggling to “just get a job” - as if half of them aren’t already working 2 or 3 jobs to try to stay afloat. No one tells you the truth like kids and old folks.